Subscribing to EZGovOpps at the Silver or Gold level gives you complete access to valuable information obtained by EZGovOpps in-house research analysts for many different opportunities. 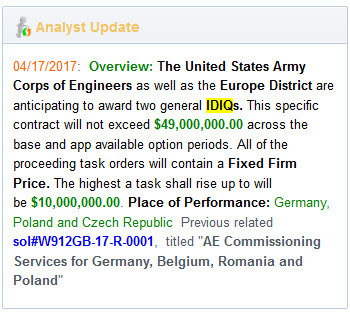 Discover incumbent information, projected value/scope, original solicitation data on recompetes (legacy information), and any details provided by contracting officers to our analyst team. …as well as many others based on their discretion. Silver and Gold plans each include the ability to request research directly from our talented staff should any additional information be needed. Example of an Analyst Update in the upper right corner of a solicitation summary.